The discovery of water on Mars got most of the world really excited; I quizzed my son on why he thought it was such an amazing find, and his quick response was ‘where there is water, there is life!’ before moving on to talk about the very exciting existence of aliens on Mars! Putting silliness of this banter aside, the fact to remember is that water signifies life; whether on Earth or on Mars. So, let’s have a little talk about how important this lovely drink is in our lives here on planet Earth. ‘You aren’t drinking enough water‘, is the most popular reply used in our family, especially when anyone, even vaguely attempts to complain about being tired, exhaustion, constipation or just about a random ‘headache’ ! To be fair, more often that not, drinking lots of water does seem to solve these problems. Think about it, when you have a cold, you’re sipping warm water; when you have perhaps eaten too much and are a bit acidic, you reach out for water (not a fizzy drink or juice). Here’s an excerpt from something I read recently at Watercures :Water flushes out the toxins – on both a systemic level and on a cellular level. Fail to drink water and you fail to flush your system as effectively as you should. The less you flush the more you leave your body at risk of disease. Fail to hydrate and have the proper electrolytes and you fail to provide the means to have optimal brain operation and energy to operate. Water keeps us cool in the summer. 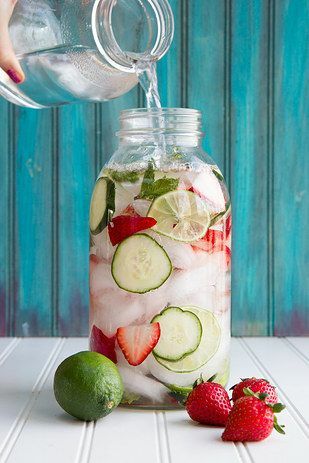 Hydration also plays a role in maintaining our heat ensuring all our body systems and function work optimally. 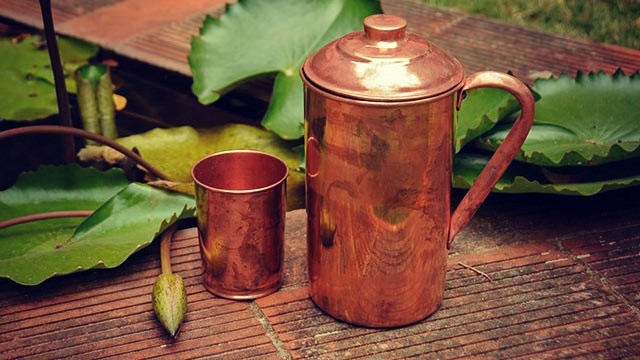 I grew up watching my grandfather drink water, first thing in the morning, straight out of a copper container, commonly known in Northern India as a ‘lota‘. It’s meant to be brilliant for your digestion as it is believed that all the benefits of copper are transferred into the water overnight just like magic! However, I never saw my family cook in copper dishes as that apparently turns the food toxic! So, before you embark on a ‘copper buying’ spree, do a bit more research. I do love present day innovations, the short-cuts to better health and of course, the developments in science, but as I am growing older, I somehow seem to appreciate the benefits of my grandparents and parents’ lifestyles a lot more; it all seems to make sense now and I believe it is the only way for a holistic, ‘chemical free’ and healthier life and drinking water is a ‘non negotiable’ part of the suggested solution for a happy life; well, I hope so, anyway! Aren’t our bodies made of approximately 75% water? Well, that’s a lot and it makes sense to drink lots of water but there are several theories about the amount of water that needs to be drunk at a given time. 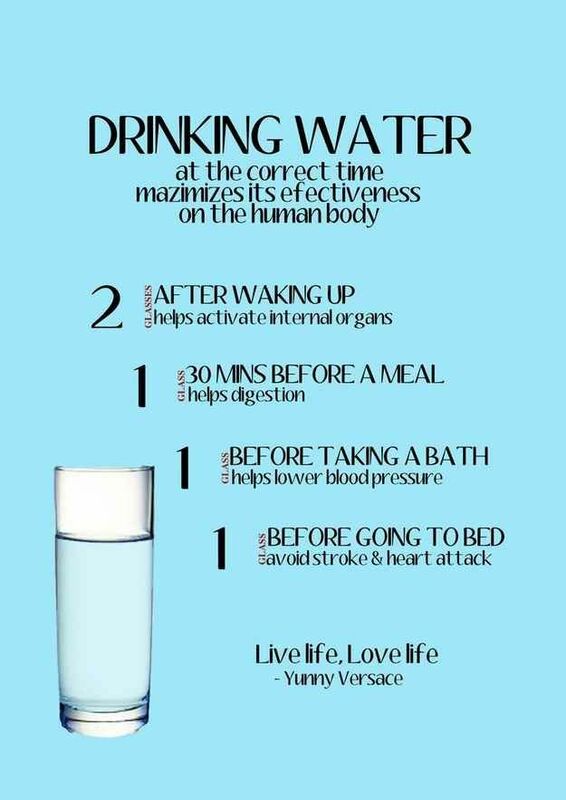 I certainly am a big believer of this ritual, starting my day with about a litre of room temperature water, followed by a glass of warm lemon water (helps to balance the acidity in the stomach; it works for me). In Sanskrit, this ritual has a name, which is ‘Usha Paana Chikitsa‘, which roughly translates as ‘early morning water treatment’, but as I mentioned earlier, do have a chat with your doctor before you start practicing this routine. Have you heard people say that if you are thirsty, you are probably already dehydrated? Well, they do have a point. Consume lots and drink water through the course of the day….when there is talk about water, there appears to be a debate on the temperature of water! Some are of the opinion that cold water is best for you as it apparently puts your system into a state of shock, which leads to burning more calories (which is good, if it works!) but the other theory is that warm water is the ‘bestest’ thing when consumed with a meal. Japanese folks typically sip on a warm cup of green tea with their meal and the belief is that the digestion of food becomes easier leading to a healthy gut. I personally like to follow the Japanese way of thinking when it comes to the discussion about the right temperature of water for drinking…remind me, aren’t these lovely people have the most centenarians? Water, water everywhere….perhaps a little bit for you too?